Flowerama delivers fresh flowers, roses, planters, cookies, and other flower arrangements to Minerva Park every day of the week including Sunday. We have four locations and are family owned and operated. 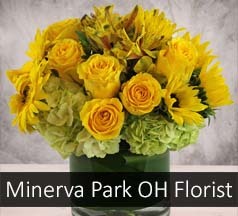 We offer same-day flower delivery and Express flower delivery to Minerva Park. Order flowers online, or visit one of our flower shops near Minerva Park. Check our "Minerva Park Enchantment" which is the signature piece for the city.